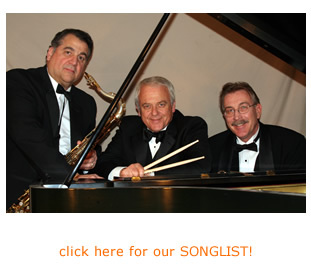 We specialize in combining a great DJ service with live piano & other talented musicians for wedding ceremonies and receptions, but also enjoy playing for corporate events, holiday parties, anniversaries, retirement parties, reunions, banquets, bar/bat mitzvahs, birthdays, conventions fundraisers, grand openings, sporting events, surprise parties, grand openings, and private parties for special occasions of all kinds. As professional Wedding DJs in Portland OR, we are very reliable and have the experience to make your event a success. Contact A Dancing Penguin for more info on our DJ and Live Music Services. the elegant and sophisticated music of the 1940's & 50's. First, they'll set an elegant mood with tasty instrumentals from George Gershwin, Cole Porter, and Duke Ellington. For dancing, you'll enjoy their Big Band Swing, and sassy Latin versions of Glenn Miller and Benny Goodman. Instrumental funk and rock can be added for variety. Requests, gladly. feature at the finest hotels and country clubs. A Dancing Penguin Trio looks forward to contributing their excitement and experience to help make your event a success. Always happy to make announcements and help coordinate to make sure everything goes smoothly. Add a DJ to the band for even more variety! Copyright 2011. A Dancing Penguin Music. All rights reserved.